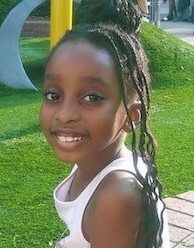 Kayla is an 8 year old girl who’s in the second grade and is Adia’s sister. Love’s going to school and going to het after school activities. Kayla likes to read and spend time with her friends and family, especially her older sister Deedee who has special needs. Child need clothes, tops and pants, dresses. Shoes and boots, winter coat, bedding size twin set and lamp. Child wants a table and chair set,unicorn headphones, hatchimals,Swicth ,ipod,books, art set.